Posted on Saturday, June 28th, 2014 at 8:26 pm. 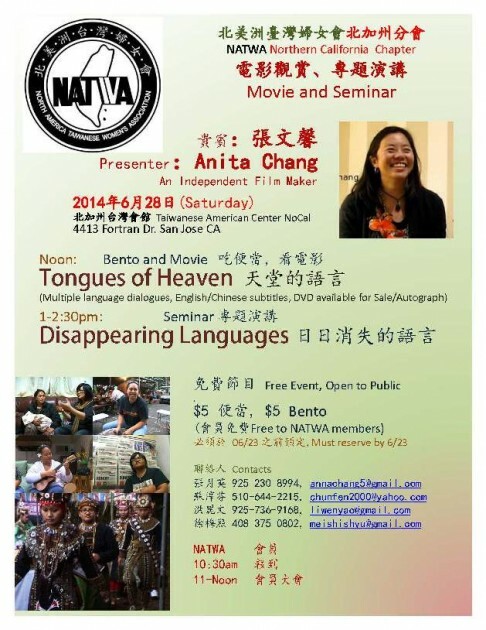 Enjoy a free screening of Taiwanese American filmmaker Anita Chang’s movie “TONGUES OF HEAVEN” with a $5 bento box and good conversations with other supporters! This event is hosted by the Northern California Chapter of North American Taiwanese Women’s Association (NATWA). Please RSVP by 6/23 for your bento box!